This a good price for installation, but please be aware of issues that HIVE has when it comes to reaching a target temperature. The HIVE designers have not used industry standard techniques to control the temperature intelligently, which results in overshoot every single time. The HIVE system will not account for the fact that the radiators stay hot and heat the room/house even after the boiler is switched off. 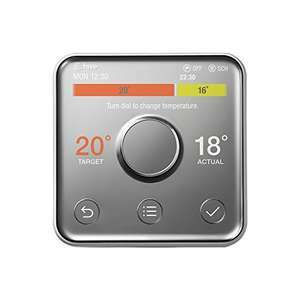 HIVE is missing technology known as TPI which can calculate how long the boiler needs to on to reach the temperature, intelligently switching it off before the room is actually at that temperature. This saves energy and maintains the set temperature with far greater accuracy and minimal overshoot. See here for a good comparison of products. I have a HIVE and I wish someone told me that they do not use TPI before I bought it. I wrongly assumed they had incorporated standard practice in to the product! Just google HIVE overshoot and you will see the problem. I've not voted cold or hot, make your own mind up folks. Great price, I paid just under this from Amazon Warehouse. Couldn't be without it now. AO have price matched it, along with saturday delivery for me.. lets see if they honor the £30 off too! AO have price matched it, along with saturday delivery for me.. lets see …AO have price matched it, along with saturday delivery for me.. lets see if they honor the £30 off too! Did you contact them to price match? Still showing as 179.99 on website? £30 off is the cash back I guess? You might be lucky in that one! I have a very new combi boiler with 7 day settings and wireless connection to the thermostat. What does this offer on top? Is it just Alexa integration (which I don't have) or is it smart and detect when your home and only switch on then? Did you contact them to price match? Still showing as 179.99 on website? …Did you contact them to price match? Still showing as 179.99 on website? £30 off is the cash back I guess? You might be lucky in that one! I phoned them on their price match line and it was the one with installation at £249 that they price matched. They do match other retailers offers. Heres what I just found out via AO. They will not price match via Argos as it's a different product number. BUT THEY WILL price match John Lewis which is £173.99 (same as Argos) as its listed as the same product number. I know, but they price match the SELLER via amazon. And the seller on Amazon for that deal is HIVE and they said they cannot price match with the direct manufacturer. Some people managed to slip through the net and bag the deal this morning, I rang up, the woman wouldnt let me do it. Rang again, and the man said their boss had literally walked in 20 minutes ago and told the team not to price match with Amazon. Im only reporting what I was told to help people get the John Lewis deal instead. I know, but they price match the SELLER via amazon. And the seller on …I know, but they price match the SELLER via amazon. And the seller on Amazon for that deal is HIVE and they said they cannot price match with the direct manufacturer. Some people managed to slip through the net and bag the deal this morning, I rang up, the woman wouldnt let me do it. Rang again, and the man said their boss had literally walked in 20 minutes ago and told the team not to price match with Amazon. Im only reporting what I was told to help people get the John Lewis deal instead. Just got a price match. initially AO had additional £30 cash back on hive products but now they have removed professional install products from that offer. This a good price for installation, but please be aware of issues that …This a good price for installation, but please be aware of issues that HIVE has when it comes to reaching a target temperature. The HIVE designers have not used industry standard techniques to control the temperature intelligently, which results in overshoot every single time. The HIVE system will not account for the fact that the radiators stay hot and heat the room/house even after the boiler is switched off. This therefore only makes it ErP class I, as opposed to NEST which is ErP class IVHIVE is missing technology known as TPI which can calculate how long the boiler needs to on to reach the temperature, intelligently switching it off before the room is actually at that temperature. This saves energy and maintains the set temperature with far greater accuracy and minimal overshoot.See here for a good comparison of products. http://www.hertsboilers.co.uk/controls.htmI have a HIVE and I wish someone told me that they do not use TPI before I bought it. I wrongly assumed they had incorporated standard practice in to the product!Just google HIVE overshoot and you will see the problem.I've not voted cold or hot, make your own mind up folks. All this TPI VOLTRON OVERSHOOT nonsense. If it's that much of a problem just boost for a period of time such as 1 hour instead of aiming for a temperature. I prefer to use it this way myself. I have a very new combi boiler with 7 day settings and wireless connection …I have a very new combi boiler with 7 day settings and wireless connection to the thermostat. What does this offer on top? Is it just Alexa integration (which I don't have) or is it smart and detect when your home and only switch on then? You can control your boiler fully via the internet i.e. from your phone when you are out and about using the app or even texting it to turn on and off. I find it very useful and cost saving. You can connect other Hive devices such as light bulbs and plugs too but I have no great need for those currently. Just checked my usage and last October I used 853 kwh gas and this October only 285 kwh. Obviously its difficult to compare like for like due to different weather conditions etc but as I live alone and do odd shifts this setup works for me. I tend to switch it on and off manually rather than faff about rescheduling to coincide with my shifts all the time.For a normal 9-5 family it probably wouldn't be so useful but I know now that I'm never heating an empty home - but I can check on the temp indoors at anytime and turn it on if it does get really cold.